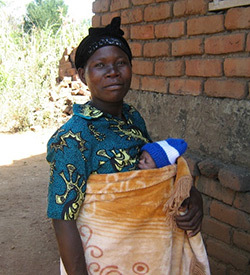 Fales Jumbe is 26-years-old and lives in Kazondo village in Balaka, a district in southern Malawi. Her village is 14 kilometers from the nearest hospital. Fales registered for the tips and reminders service offered by Chipatala cha pa Foni (CCPF) in the third month of her fourth pregnancy. She listened to the weekly messages on the CCPF volunteer’s phone, as she did not own a phone. In the eighth month of her pregnancy, Fales started experiencing severe back pain and started leaking amniotic fluid. Her husband and family took her to Machinga District Hospital where she was admitted. At the hospital, Fales did not feel that the health workers were addressing her condition or providing her with adequate care, so she left and returned to her village. Unfortunately, Fales’ condition continued to worsen and her husband and relatives were greatly concerned but did not know how to care for her or what needed to be done. They did not want to return to the hospital for fear of reprisals by the hospital staff. Fales then remembered Chipatala cha pa foni and she advised one of her relatives to call the hotline for help. Upon hearing her symptoms, the hotline worker explained to Fales that her water had broken and transferred her to the hotline nurse who was on duty who further described the danger of early water breaking in a pregnancy. The nurse advised Fales to go to the hospital immediately for medical attention. Fales arrived at Balaka District Hospital that same day where it was confirmed that her water had broken and she had lost almost all of her amniotic fluid. Fales and the baby were at very high risk of potentially fatal complications. Fortunately, Fales delivered the baby prematurely through spontaneous delivery. Having delivered at the hospital, she and her baby benefitted from the nurse’s advice on kangaroo mother care, an important practice for mothers of premature babies. Two days later, Fales and her baby were discharged from the hospital and on their way home, they stopped by the CCPF hotline office to thank the staff, especially the nurse who had advised them to immediately report to the hospital. Fales and her mother expressed their gratitude to Chipatala cha pa Foni for saving Fales’ and her baby’s lives and educating them that early water breaking is a danger sign and requires a visit to the health facility as soon as possible. Fales also said she planned to enroll her baby into CCPF’s tips and reminders service for newborns, as she is sure her baby will benefit, much like she did from the pregnancy tips and reminders service.